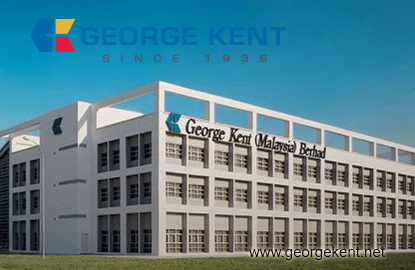 KUALA LUMPUR (Aug 3): George Kent (Malaysia) Bhd shares climbed to its historical high in the morning trades after a bullish analyst report on the construction outfit's outlook described the company as a formidable engineering force. At 11.27am, the stock was traded at RM2.31, up nine sen or 4.05% after 2.51 million shares changed hands. It had earlier climbed to its intra-morning high of RM2.32. George Kent was one of the top gainers across Bursa Malaysia during the mid-morning session. The current price gives it a market capitalisation of RM666.91 million. In a note yesterday (Aug 2), Hong Leong Investment Bank Research (HLIB Research) said George Kent is a formidable engineering force that can no longer be ignored. It pointed out that George Kent managed to deliver its systems works for the Light Rail Transit (LRT) extension on time, within cost and was profitable although it faced challenges given delays by the civil contractors. The research house said the appointment of MRCB-GKent JV, in which the group has 50% ownership interest, as LRT3 project delivery partner (RM9 billion) will be the next growth driver. "Sizable orderbook of RM5 billion implies superior 12.5 times cover ratio, the highest within our coverage. Potential to expand water meter supply to untapped states of Selangor and Melaka. "Solid financials with 3-year earnings compounded annual growth rate (CAGR) of 17%, above industry return of equity (ROE) of 15% and net cash of 74 sen per share," the firm noted. HLIB Research initiated coverage on George Kent with a "buy" rating and target price of RM3.23.